Vancouver, August 22 – Leading Edge Materials Corp. (“Leading Edge Materials”) or (“the “Company”) (TSXV:LEM) (Nasdaq First North: LEMSE) (OTCQB: LEMIF) is pleased to provide the latest results from spheronisation test work undertaken on graphite from the Woxna graphite mine in Sweden. Woxna is a fully constructed mine, with all processing, waste management and infrastructure in place. During 2017, Woxna was granted an extension to its operating license until 2041. As previously disclosed (5th July 2018), Leading Edge Materials is undertaking various research and development activities designed to support the design and installation of a battery materials demonstration plant at the Woxna mine site. The demonstration plant will have the capacity to supply meaningful (100’s of kgs) quantities of lithium ion battery anode material to prospective industrial customers. A s part of this research and to enable robust equipment selection, the Company is undertaking comparative spheronisation programs at a variety of facilities. This current test program follows on from preliminary testing carried out in 2017 and delivers an insight into repeatability of equipment and operator. Equipment performance data is used to facilitate selection of equipment that can provide the range of shape and particle size distributions being requested by prospective customers. An ability to customize anode products based on particle size distribution and purity will allow Leading Edge Materials to meet a wide range of customers specifications. 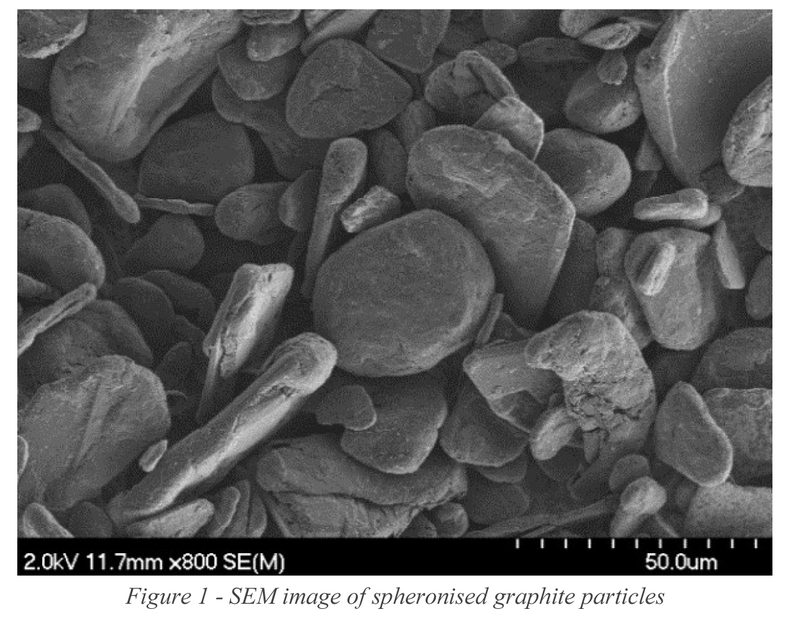 Spheronisation (also known as spheroidisation) is a milling and shaping process that reduces the size of graphite flakes while shaping the flakes in an elongate spheroid. Target size range is dependent on the end use of the battery, typically varying from 8 to 30 microns. Spheronisation is undertaken to optimize the particle surface area to achieve the highest performance in the anode. The current work program was carried out at an independent facility, with the Woxna general manager, Peter Young, on site as an observer during testing. Feed material was “run of mine” from the Woxna beneficiation plant with a grade of approximately 94% carbon and a particle size D50 of 285 micron, a near optimal size as feed for spheronisation. The desired particle size distribution was achieved with a D50 of 25.5 micron. The particle shaping showed smooth, spherical particles (Figure 1) that were consistent and comparable with prior spheronisation results, providing confidence that similar results can be achieved within a demonstration plant installed on the Woxna site. Characterization was performed using Particle size analysis (PSA), Brunauer-Emmett-Teller (BET) surface area measurements and Scanning Electron Microscopy (SEM). Blair Way, President and CEO, stated “The spheronisation test program we have underway is delivering the data required for equipment selection for the Woxna battery material demonstration plant. Repeatably producing a high quality well shaped graphite product is an important step and provides confidence that similar equipment on the Woxna site will deliver market-ready lithium ion battery anode materials”.